Today’s new data from the U.S. Census Bureau show that, at long last, American households are seeing their incomes rise after the Great Recession. 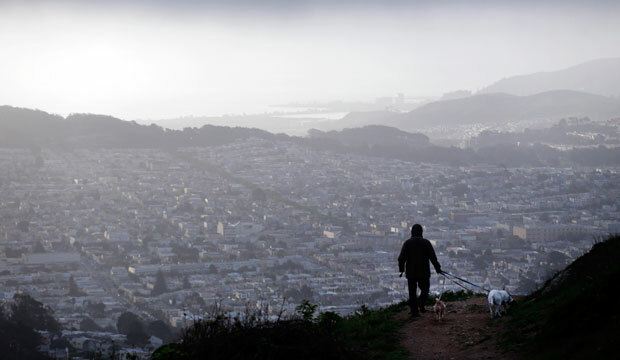 In 2015, the median household income rose by an outstanding 5.2 percent to $56,516, a much-needed boost after three years of statistically insignificant changes. While this is welcome news, it is important to remember that much work is needed to bring middle-class incomes up to previous highs: In 1999, the median household made $57,909 in inflation-adjusted terms. 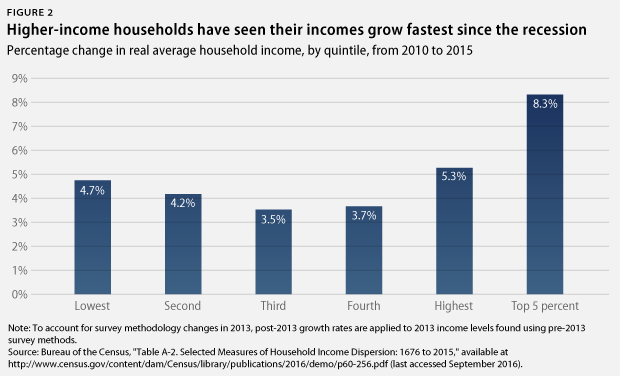 These new data show that households at all income levels have seen solid growth since 2014. In fact, the households in the lowest quintile by income saw their incomes grow by the largest share in 2015: 6.6 percent. Households in the middle 60 percent experienced 4.8 percent annual growth, while incomes for the top 20 percent rose by 4.2 percent since 2014. This year’s growth helps counterbalance the unequal growth of the post-recession years, but the wealthy are still capturing a large amount of U.S. income growth since the recession’s end. As shown in Figure 2, in the five years since the recession, the middle 60 percent of households saw their average incomes grow by 3.7 percent. In contrast, the top 20 percent of American households by income received a 5.3 percent boost to their incomes in the same five years on average, with the top 5 percent of households experiencing even bigger gains: 8.3 percent. Even as middle-class households saw solid income growth in 2015, the share of income accruing to the middle class remains at near-record lows. The latest Census Bureau data show that the top 20 percent of American households continue to bring home a majority of national income. Meanwhile, the middle 60 percent of households received just 45.7 percent of national income—far below their 1968 peak of 53.2 percent. 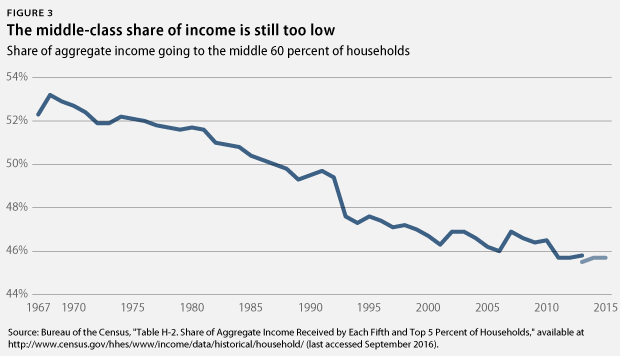 As shown in Figure 3, the downward slide of the middle-class income share is not a new phenomenon. Decades of declining worker power, challenges from globalization, and increasing levels of market concentration have all contributed to the weakening of the middle class. Had the share of national income accruing to the middle 60 percent remained at 1968 levels, the average middle-class family would have earned about $9,900 more in 2015. 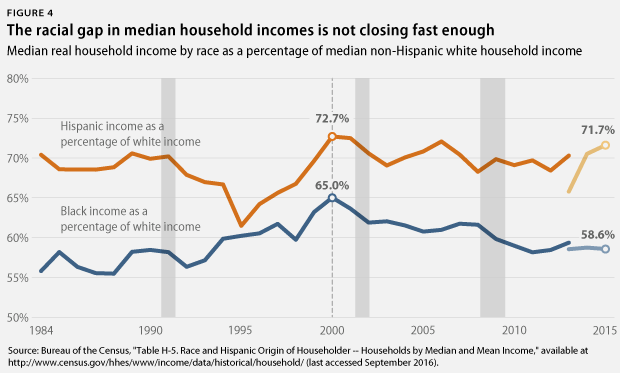 These new data also make clear that more work is required to close long-standing income gaps between non-Hispanic white households and black and Hispanic households. * In 2015, the median black household made just $36,898, or 58.6 percent of the median white household. Similarly, the median Hispanic household made 71.7 percent of the median white household—$45,148. These households are still further behind their white counterparts than they were in 2000. Structural biases and the accompanying racial income gap have real consequences over time. A recent Center for American Progress analysis shows that middle-class black and Hispanic households have also accumulated much less wealth than their white counterparts. Incredibly, the average middle-class black household headed by an individual age 25 to 54 with children had just $6,600 in wealth in 2013, compared with $154,600 for whites. After a massive financial crisis and the resulting Great Recession, the U.S. economy and the middle class were in dire straits. But since then, a record streak of job gains and accompanying economic growth have brought the country back from the brink. The latest Census Bureau data show that middle-class families are finally seeing this progress reflected in their household incomes. However, policymakers must work to continue the progress shown in these data. The nation needs continued, strong, and broadly shared growth. 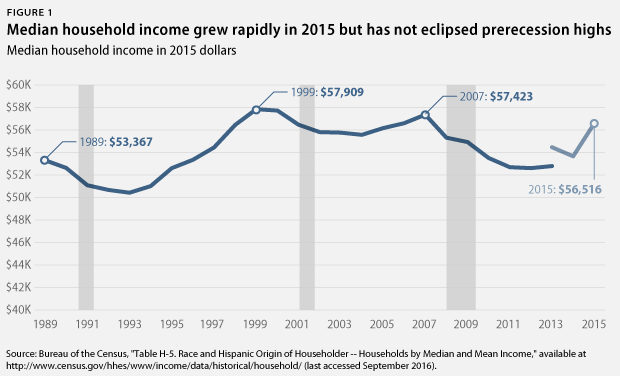 While growth from 2014 to 2015 has been more even, there are many years of growing inequality and stagnant wages from which the middle class has yet to recover. But this inequality is not a predetermined fact; it is a choice. Policymakers should pursue an economic agenda that would bring higher wages to both middle-class families and low-income families working to join the middle class. They should raise the minimum wage, guarantee paid family leave and paid sick days, and make it easier for workers to come together and negotiate collectively. The nation’s monetary policy should be focused on securing full employment, which can especially benefit workers of color. The United States should take advantage of low interest rates and invest $500 billion in infrastructure in the next 10 years. Policymakers should put affordable, high quality child care and higher education within reach of all families. This progressive agenda has been stymied in recent years by congressional inaction. But next year, there will be a new opportunity for policymakers to fight for policies that benefit all Americans, not just those at the top. To continue rebuilding the middle class, it is critical that they do. * Note: Due to data limitations, it is difficult to accurately assess the household income of the Asian American population in the United States because there are significant differences in economic well-being for each subpopulation. Alex Rowell is a Research Assistant with the Economic Policy team at the Center for American Progress. David Madland is a Senior Fellow at the Center.